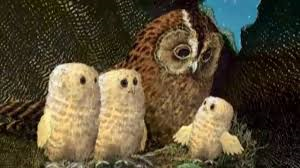 This week we have been reading and discussing the book called 'The Owl Babies'. We have thought about why the baby owl was so worried and what noises, in the night time forest, may not have helped this feeling. We have also described the owls and discussed their feelings at the end of the book. Our favourite owl is Bill, the youngest one. He says 'I want my mummy' throughout the book and when she returns he says 'I love my mummy'.